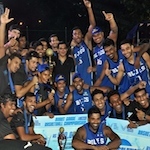 India clinched the top spot in SAARC Division Qualifying Tournament of the Middle Asia qualifiers for Fiba Asia Championship preliminary Group A. They overcame Sri Lanka to top the ladder in just two-teams group. India and Sri Lanka both advanced into the semifinal stage scheduled for tonight in New Delhi. Vishesh Bhriguvanshi (192-G-91) stepped up with 16 points to lead the hosts. India stunned their opponents in the opening quarter. The hosts posted a 32:5 lead after ten minutes. Sri Lanka never came back to life as India rolled to a confident win at the end. Prakash Mishra (180-G/F-82) and Japdeep Singh (199-C-86) delivered 15 points each for the winners. Suran answered with 11 points for Sri Lanka. Senananyaka had 10 points in the loss. India will now take on the winners of Banghladesh vs. Nepal clash in the semis.